Imagine you are a successful 50-something car fanatic and you've decided it is time for your supercar. Do you buy an older Ferrari 355 for $50k or a newer Porsche 911...or do you save a pile of cash and pickup something more exclusive and far less douchey? Like this 1989 Lotus Esprit Turbo offered for $19,500 in Des Plaines, IL via craigslist. Tip from Rock On! 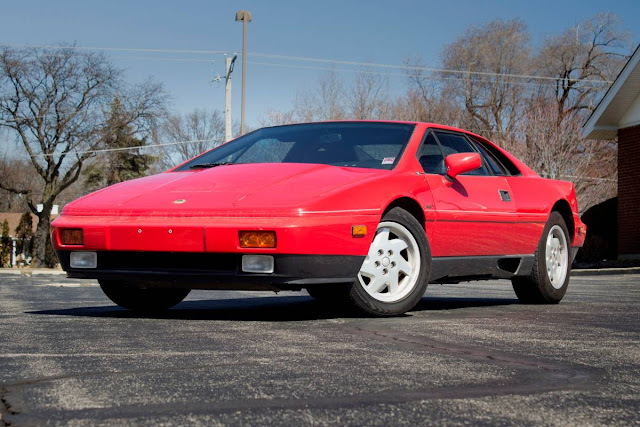 You are looking at a 1989 Lotus Esprit Turbo, one of the 80's most iconic and fastest-appreciating sports cars. With everything from classic Ferraris to Fieros having doubled in value over recent years, this fine piece of English motoring history can only appreciate in the years to come. 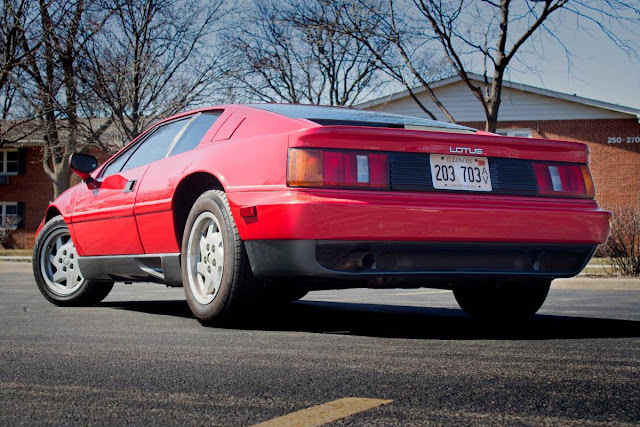 Driven just a tick over 1,000 miles a year throughout its life, this Stevens Edition Esprit is one of lowest mileage and best preserved examples of its kind in the world today. This car remains true to the vision of designer Peter Stevens, not as weighed down by kitsch as later cars, and more robust in construction than earlier Esprits. It's also tremendously quick. How many other thirty year old cars can boast a five second zero to sixty time? 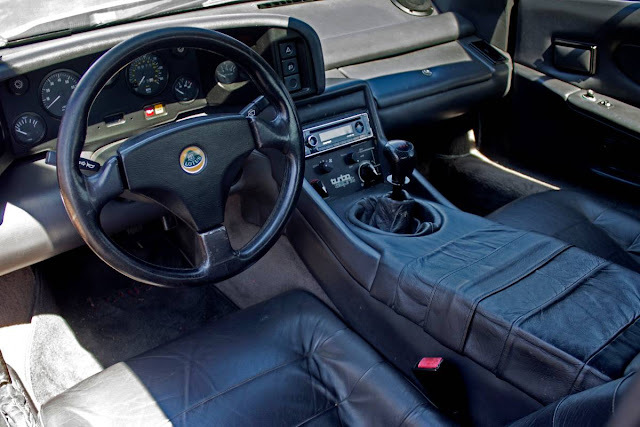 Done in black, this car's all-Connolly interior is one of the finest, and best preserved of its kind. This one is impeccably maintained, and has been regularly oiled and cared for throughout its life. It took me a while to find a car with a black interior, something I insisted on knowing how badly an example with tan interior would age. The exterior, being an all fiberglass body, has aged beautifully. It does not sag, does not rust, and has no door dings or dimples. It is straight as an arrow. I have put less than 1,000 miles on her in the last 24 months. This Esprit is owned by an enthusiast, and not some kid out of high school with a couple hundred dollars, and a dream. Sadly, it is exactly that kind of car which pops up every so often, one that comes with its original tires, belts, and hoses. The very moment the new owner drives the car, things begin to go hay wire. Seats start tearing from lack of care for the leather, fuel injection systems start clogging from neglect, oil leaks on the ground, and the list goes on. Please do not make that mistake. Just a couple of months back there was an Esprit for sale on eBay that had Goodyear Eagle GT tires, a tire which hasn't been available in the U.S. for over 14 years. I can tell you what happens to 14 year old tires at speed. It also had faulty door hinges, making the door ruin the paintwork when you close it. Ask about all of the common problems with these vehicles. For example, "Has the timing belt been changed in the last two years?Have the emissions lines been changed? When was the last schedule C service? Does it leak any oil? Does the turbo smoke? Have ALL of the fluids been changed? When were the shifter bushings changed? Does the clutch bearing make any noise? Was the clutch line upgraded? When were the engine cooling hoses last replaced? May I see the service records? Do the headlights work properly? Do the doors sag? Is there any rust under the vehicle? 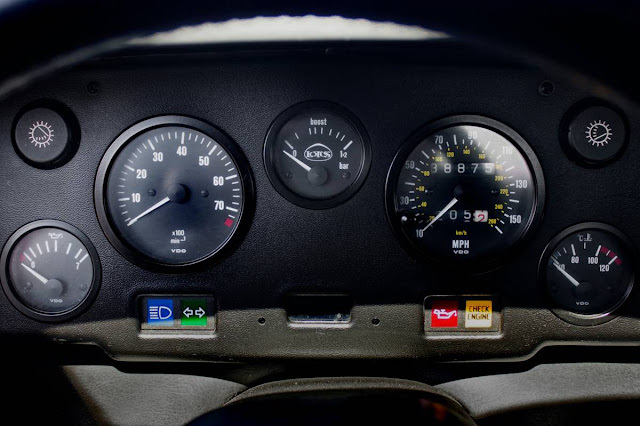 Do all of the gauges work properly? Have the body drains tubes been cleaned out? Has the car been garage kept?" If you are looking at other Esprit listings, make sure you ask these questions. This particular Esprit ticks all these boxes. My car has 39,000 miles on it, is adult owned by someone who has the knowledge and resources to maintain these cars, and is garage kept. 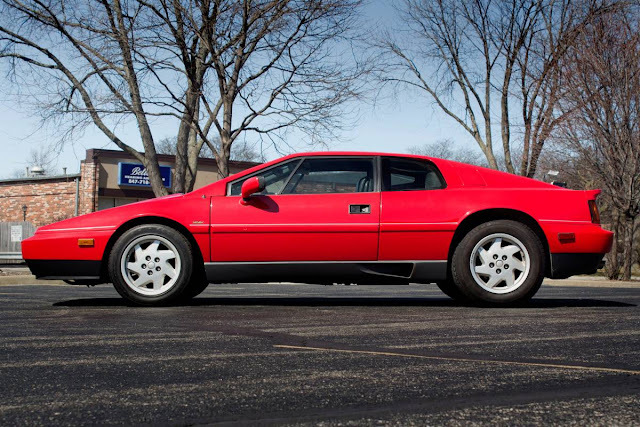 The Stevens body Lotus Esprit has a GM engine management system as Lotus was owned by General Motors for some time. It comes with the later Renault gearbox, which is less stressed than the Citroen gearbox in earlier models. It also lacks the big and bulky airbag-equipped steering wheel of later Esprits. An important consideration if you've got long arms and find the space a bit tight! If you need a coil, injector or and engine sensor you can get it at the local Chevy dealer. Many of the parts are off the shelf and therefore the parts are available and cheap. I buy all of my Lotus parts from JAE. Compared to all other exotics this car is easy to work on, too. The tail lights are out of a Toyota, door handles from an older Range Rover etc. The engine bay is clean and not cluttered with the extra charge-coolers and accessories found on newer Esprits, and is easy to work in. My Lotus is stock, and not been modified or messed with. It has all of the fun of an exotic car with none of the drama. Is it perfect? No. But I bet the interior is in better shape than your neighbor's 5 year old Ford. Body and paint in good shape, too.I invite you to stop by, and drive this vehicle as you will buy it! Luckily for this guy that Craigslist doesn't charge per word! Google the VIN and find this car previously on sale at two places in CA and one place in LA. With one ad with the same sales spiel. Now in IL, sure gets around. Have never seen a Lotus Esprit with high miles. At least this one has wheels on it unlike most Europas. Vivian: Man, this baby must corner like it's on rails! Vivian: Well, doesn't it blow your mind? This is only four cylinders! Sean- What a great video. Thanks for sharing.